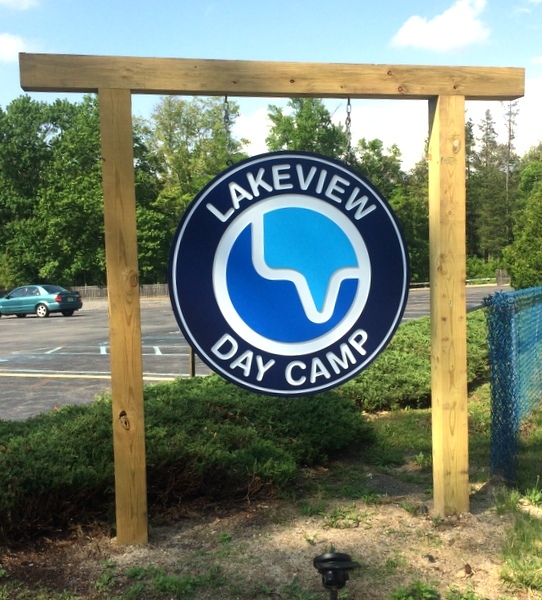 Above is carved sign for "Lakeview Day Camp" This 2.5-D sign is carved from High Density Urethane (HDU), with engraved text and border, and a stylized map of the lake inlet as artwork. The backgrounds are smooth. The sign is clear-coated twice for additional UV protection. This sign can be mounted on a interior or exterior wall, a post, or hung from a wrought iron scroll bracket or beam (as shown) supported by two posts. The attractive carved 2.5-D HDU Lakeview Day Camp sign shown above has as its focal point stylized artwork of a map of the lake inlet. The text, art and border are raised at 3 levels in 2.5-D (flat) relief. The sign is hung from chains below a 4 x 4 beam.